When Mike Caputo had a stroke at age 50, he and his wife Kathy started living with aphasia. When formal rehabilitation ended, Mike and Kathy realized how much they needed the support of others. They did more than just gather up their own friends—they created a nonprofit organization founded in St. Petersburg, FL. Living with Aphasia: Talk, Laugh, Live! Their flagship group program for people with aphasia offers everything from Aphasia Book Club, to conversation group, to hands-on art, music therapy, and community outings. They provide group programs at three different locations, four days a week. “I Have Aphasia – Now What?”: Their specially-developed, two-day workshop focused on family and home communication is offered at local hospitals and rehabilitation facilities. 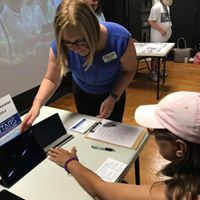 Most recently, they were honored to offer the workshop at the University of Florida at Gainesville! Two upcoming workshops in Largo and Bradenton are on the calendar. 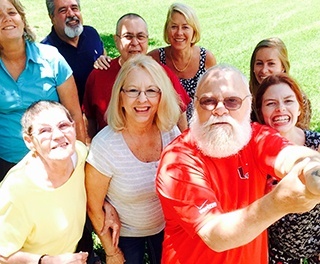 Caregiver Group: Groups aren’t just for people with aphasia—caregivers need groups, too! Voice of Hope for Aphasia is fortunate to have a life coach/counselor who is knowledgeable about aphasia leading their twice-monthly caregiver group. STARS Technology Program (pictured at the right): Their newest program that just launched in June, STARS is an aphasia-friendly approach to learning about using technology—everything from how to turn on you iPad to using more sophisticated apps that can help you manage your medications or support your communication. Voices of Hope for Aphasia wants to empower people living with aphasia, reduce social isolation and its health consequences, and educate communities about aphasia. Here are a couple examples about how they do that. Their upcoming gala, Aphasia’s Got Talent, showcases all of the things that people with aphasia CAN do. The judges are local celebrities who will help make the evening a fun, friendly event. And they’re honoring the leaders of a great aphasia group, the Suncoast Aphasia Support Group in Sarasota, with their Founder’s Award this year. 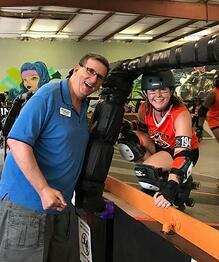 Every community outing is an opportunity to train the people at one of their local businesses, like their Aphasia Awareness Roller Derby (pictured to the left). They’re working with the City of St. Petersburg to help train all city employees about best ways to communicate with people with aphasia and other communication disabilities. Voices of Hope for Aphasia aims to touch the lives of 100% of the people living with aphasia in their area. Please go to their website, www.vohaphasia.org, to participate or help them help others.